Today I made a birthday card for a friend of mine who loves dogs. It gave me the opportunity to ink up an image I hadn't previously used in the The Wilderness Awaits stamp set. 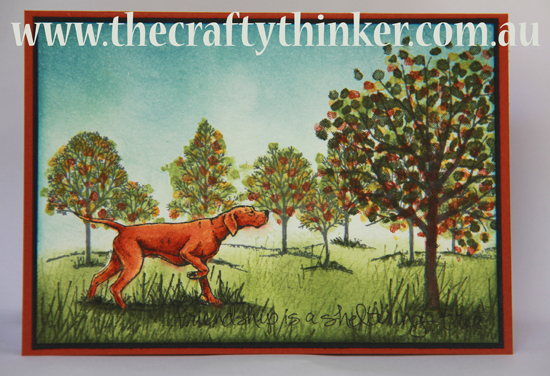 He seems to be a good hunting dog, so I thought I'd better add some trees. It's always a joy to use Lovely As A Tree (one of my all time favourite stamp sets!) and I added Sheltering Tree. I decided to add some autumnal colours to the trees. 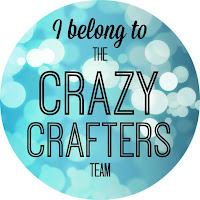 I have entered this card into Kylie's Crazy Crafter Team Projects this week - click on the image to see all of the amazing projects entered this week and vote for your favourite. Without getting too bogged down in detail, this is an overview of my plan. Stamped the dog with black ink and masked it. Sponged the sky with Soft Sky and then the top part with some Marina Mist. Sponged the grass with Pear Pizzazz. Stamped the same grass over the rest of the grass area in Pear Pizzazz but stamping off first. Used the small leaves image from Sheltering tree to add leaves to the small trees in Pear Pizzazz, Crushed Curry and Cajun Craze. Stamped the tree leaves image from Sheltering Tree on the big tree in Pear Pizzazz, Added some Crushed Curry and Cajun Craze with the small leaves image. Went over the right side of the big tree trunk with an aqua pen and a little Cajun Craze. Added some watercolour Mossy Meadow under the dog and trees. Added Cajun Craze to the dog, working in layers a bit at a time to create highlights and shadows. Sponged a little bit of Mossy Meadow to the lower edge of the panel. Stamped the sentiment from Sheltering Tree to the shadows. The painted panel is layered onto Basic Black cardstock and then onto the Cajun Craze card. Thanks, Ange - labour of love!